I used to keep my polishes in a box when I was in high school (1996 graduate, yep I'm old). Anyway when moving to California from Alaska 7 years ago I threw out my nail polish! A few days ago I found 3 that weren't in that box, wooo! Can I salvage these? They are from the mid/early 90's so I'm pretty dubious. Malaga Wine, my all-time favorite red. No wonder this one wasn't in the box I wore it all the time. 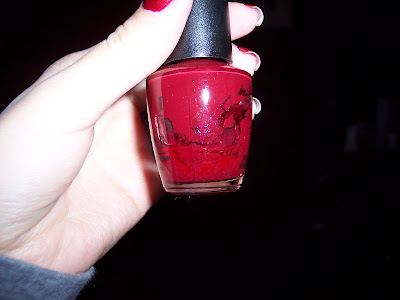 I saw this color at the OPI site so why mourn the loss of a polish I can go buy anytime, right? Marooned on Mammoth, I have no idea when or where this came from, but this one looks bad. I rolled it a little before the pic so you can't see the dried gunk in there. I also found an OPI base coat from the 90's lol. It's half full and not thick at all, crazy! Over the years I have put thinner in all my polishes (including these 2) but never when the polish is dried and stuck in the bottle. To toss or not to toss? I've seen pics looking worse than that! It can be saved, just drop in some thinner, little by little and shacking the hell out of it after every other drop or so. It's definitely worth trying to save, those are some great older colors! I've used thinner and had good luck reviving polishes I thought could not be revived. I've never tried to revive but I'd be interested to hear how you get on as I have a knackered old Flashbulb Fuschia that could do with some resurrection! Thanks for the suggestions, I will try to thin them out. I don't own any thinner at the moment so next time I'm out shopping I'll get some and post some results!